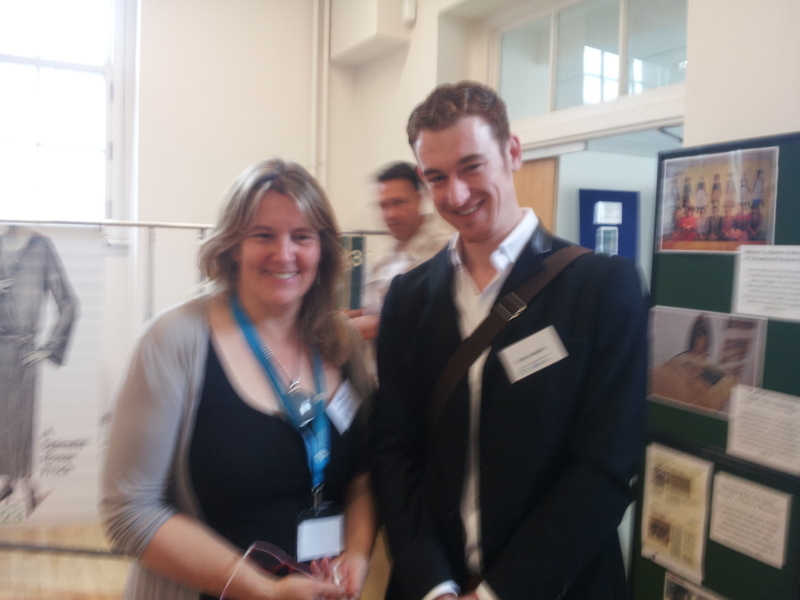 Report of Dr Paul Huddie, winner of the 2014 Anna Parnell Travel Prize. The Annual Conference of the WHAI’s peer organisation in Britain – the Women’s History Network – was held this year at the University of Worcester and was organised around the broad and indeed international theme of ‘Home Fronts: Gender, War and Conflict’. It was organised and held over three days (5-7 September) in the Charles Hastings building located on the university’s campus, and was superbly organised by the university’s own Professor Maggie Andrews and Elspeth King, along with a large cohort of friends, colleagues and volunteers students. It consisted of nearly one hundred papers, ranging from local studies, such as those on Belgian refugees in Yorkshire during the Great War and the laboratory wives of Los Almos during the Cold War, to national and international studies, such as the German women in the French area of occupation after the Second World War and the non-combatant women in wartime South Vietnam. Interspersed among these were also four keynote papers by Professor Susan-Mary Grant (University of Newcastle) on southern women during the American Civil War, Professor Karen Hunt (University of Keele) on gendering the Great War local home front, Dr Deborah Thorn (Robinson College, Cambridge) on the history of the public history of women and war, and Dr Lisa Pine (South Bank University) on German women on the Second World War home front. 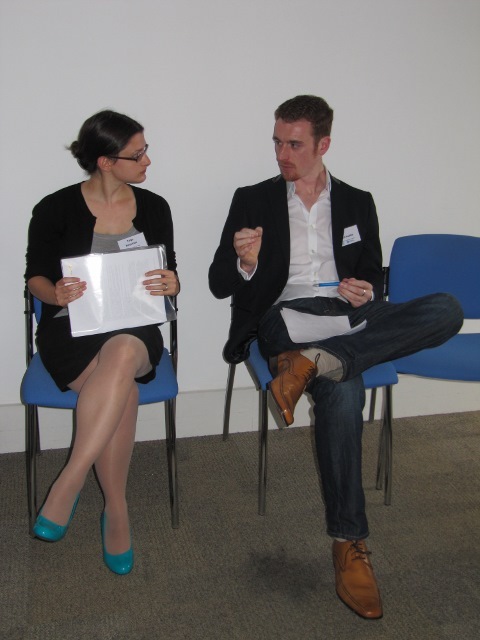 This conference also succeeded in drawing together a number of different researchers of British army wives, in Ireland, Britain and overseas, together under one roof; namely Dr Paul Huddie, PhD candidate Fionnuala Walsh (Trinity College Dublin), Dr Eliza Riedl (University of Leicester), and Professor Charlotte Macdonald (Victoria University of Wellington). 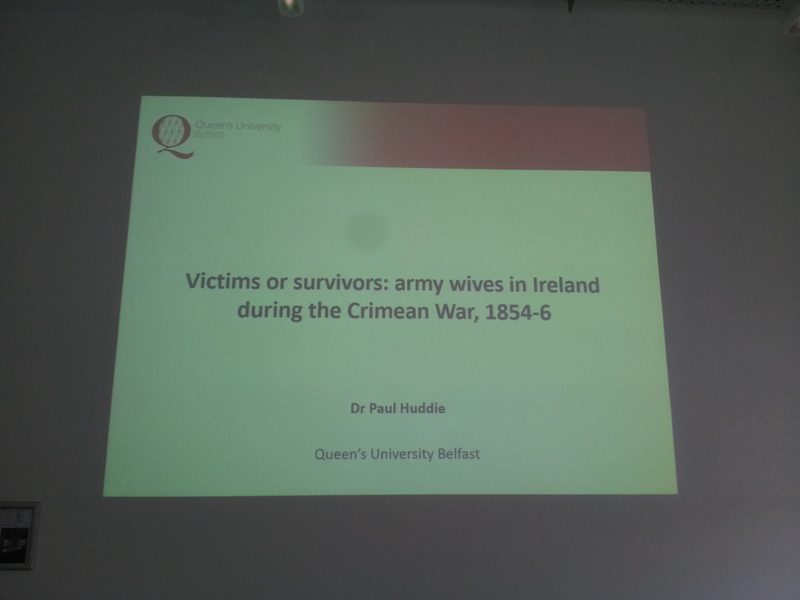 On the second day of the conference the mid-day panel, which had the theme of ‘Violence and Survival’, consisted of two papers, one of which was entitled ‘Victims or survivors: army wives in Ireland during the Crimean War 1854-6’ and was presented by this year’s recipient of the Anna Parnell Travel prize, Dr Paul Huddie. That paper sought, as the title suggests, to ascertain the extent to which women, due to the circumstances in which they were placed between 1854 and 1856, were victims and survivors of that war. This project also forms part of a wider study on Irish society’s response to that conflict which is due to be published next year by Liverpool University Press. Part of the presentation drew attention to the prominent place which women’s history has come to obtain over the past few decades in the area of social military history, particularly in Britain. Here the work of Catriona Kennedy, Myna Trustram and Helen Rappaport was noted in the areas of soldiers’ and officers’ wives and their families and their lives and interactions with the state and general public in the long nineteenth century, and the contributions of educated society women in Napoleonic Britain to the perspectives and memory of the wars with France. The paper then drew attention the largely Anglo-centric nature of this British historiography and to the contrasting lack of similar research in Ireland, in spite of the prominent role of Ireland in the British military throughout the long nineteenth century. With these aspects addressed, the Crimean War was then used as a case study to bring attention to this gap in Irish social military history and to analyse the lives of army wives in Ireland (at that particular time) within the wider sphere of the United Kingdom. The paper also argued four key points: that everything which has to date been highlighted, analysed and discussed in the existing British histories of women during and after the Crimean War, more often occurred in Ireland too, albeit to a generally lesser extent, that the war was a noteworthy period in women’s history in nineteenth-century Ireland (as it already is in British women’s history), that it offers a clear comparative to the experiences of women during the Boer War and Great War, and that army wives represent a substantial stratum of women in pre- and even post-independence Ireland, who are worthy of further dedicated research. This it did through the use of a variety of contemporary Irish and British newspapers, the Kilmainham Papers, the Chief Secretary’s Papers, and the annual reports of the Royal Patriotic Fund and the Central Association in Aid of Soldiers’ Wives on Active Service. All of which served to illustrate the numbers, socio-economic and geographical dispositions of military wives in Ireland within the broader UK context, but also that it was no easy task for army wives to survive during wartime. And while the strains were shown to be sometimes too much for some women in Ireland to bear, as it was for many in Britain, the paper illustrated that similarly army wives in Ireland showed the same dogged determination not to become complete victims of their circumstances during the Crimean War. Rather, though the use of petitions, relief, employment and sometimes emigration they sought to master them as best they could and thus be primarily survivors and not victims of the Crimean War.